Do you REALLY know what your customers want? It’s a moving target and if you don’t meet their wants and needs, they’ll move on to another vendor. 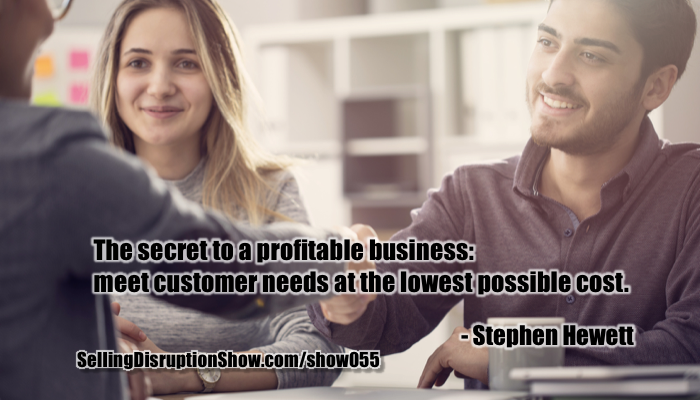 Stephen Hewett, inventor of the Net Customer Needs Score shares how to identify what customers need, how to stay ahead of your competition, and how to disrupt and avoid disruption. 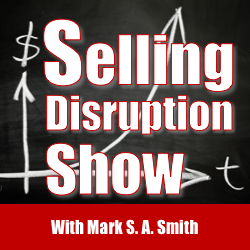 Mark S A Smith: My guest today is Stephen Hewitt, who is the executive director at iCustomer, and the internal consulting group Global Thought Leader on customer needs and growing your business by identifying and providing those needs to your customer. He is the creator of the net customer needs score that allows us to understand if customers are getting their needs met and what to do next. He is also the author of three books, The Customer Centric You, People Centricity, and Customers Are the Agenda. He is also a pilot and a strategic thinker about how to make more money as fast as you possibly can. Welcome Steven. Stephen Hewett: Hi Mark. It’s a pleasure to be here. Mark S A Smith: Tell me about how you chose to create this net customer needs score. We’ve all heard of the net promoter’s score, and you’ve come up with what you think is actually even more powerful. I happen to agree with you after our conversations. Tell me how you came up with this? Stephen Hewett: Well Mark, it actually started a long while ago. As you mentioned in your kind introduction, I started life as a pilot and when I was taught to fly, I was given an option. I was told that I could be taught by rote or I could be taught by first principles. And first principles are always better because you only have to learn a small number of things, and then you can apply those principles to pretty well everything that happens to you when you’re flying. And I’ve chosen to take that piece advice forward into my business life which I’ve been doing for the last 30 years. Mark S A Smith: Let’s just take a break there because what you just said was a massive piece of brilliant information that every executive needs to wrap their head around. You have the choice to learn either by rote, or by first principles. The difference between those two is difference between training and education. Training is by rote. “Do it in this procedure. Do it in this process.” And the challenge when we use rote training for our teams, is they have very little latitude to adjust when things change. The problem with that is anybody who accepts rote training is at risk to be replaced by artificial intelligence and robotics. Stephen Hewett: You’re absolutely spot on. And by it’s very nature rote can only do with a set number of scenarios. Stephen Hewett: And the reason I was taught to fly the way I was taught to fly is because if you fly that way, sooner or later a scenario will turn up that will kill you. Mark S A Smith: Guaranteed. And it kills people on a regular basis. Stephen Hewett: It does. And there are people out there still learning to fly that way. But, by learning a simple set of principles, whether it’s flying or running your business, or interacting with your clients, then you genuinely are prepared for pretty well any scenario that turns up, as long as your agile enough to apply that on the fly. That’s something that I’ve applied through my business career well, forever. And I’m pleased to say so far it’s been successful. Mark S A Smith: Well that dials right into my belief that we’ve talked about on the show a number of times which is the concept of systems thinking versus goals thinking. And rote is really about goals, first principles is about systems. So I really like that set up. That’s a great foundation. Please continue on about how you’re applying first principles to the business that you do. 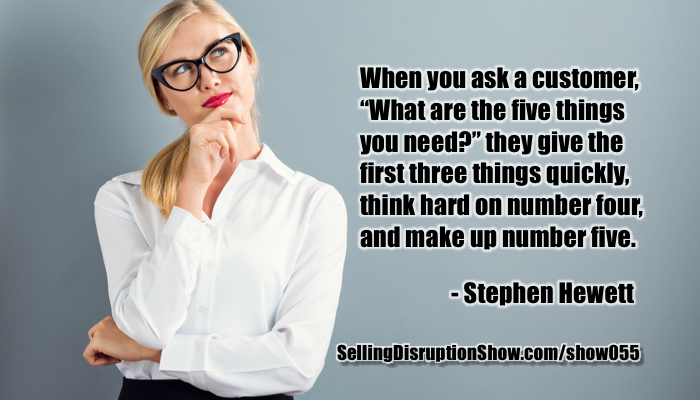 Usually a customer will talk about one to three things pretty quickly. They’ll probably think a bit harder about number four and tell you what it is, and then they’ll make up number five because I asked them. Stephen Hewett: Yeah. Exactly. Exactly. And then the only real question is, if I hear that from one customer, do I have that piece of feedback times a million customers? Or in fact is there commonality across the customer base? And you know what? In 15 years of applying that principle there’s a huge amount of commonality. So there’s simple secret areas that there’s a relatively small number things, needs you might call them, that you have to fulfill for your customers. And if you do that really well, you’ve created a marvelous footing on which to create really great customer experience. Mark S A Smith: Mm-hmm (affirmative). And that customer experience creates competitive advantage. It creates the ability to continue to grow your value, and to continue to make profits in a world where profit seems to be difficult to come by. What do you see as the trends in what customers need as far as a net customer needs score? Stephen Hewett: Let first of all just talk a little bit about net customer needs, which is what you asked me earlier. Mark S A Smith: Let’s get that horse in front of the cart. Stephen Hewett: So the simple concept about that, to define what that small number of needs, that group of needs and for even a large global company that may be as small as 15 to 20 needs for all their customers. Then if you know what those needs are, then the next common sense thing to do is measure them. That’s exactly what net customer needs score does. It basically allows you to work out, “Am I meeting those needs, or not meeting those needs?” And as you’ve already said, there isn’t an option about meeting those needs because they’re fundamental. They’re basic. They’re the things that you must have. You can easily express the score as the number of needs being met against the number of needs not being met. The probability of defection, churn, and not doing business with you in the future goes up dramatically if you’re not meeting those small number of key things. There are lots of statistics that prove this, but actually all you really have to do is sit back and use your common sense and say, “Well that must be right, mustn’t it?” And that simple bit of thinking, and that simple way of measuring the basis of net CNS, customer needs score, and the whole philosophy and thinking around how to understand what your customers need. Mark S A Smith: I think that’s a really elegant system that you’ve created. It’s one of those blinding flashes of the obvious. And yet people just don’t do that kind of surveying or understanding, or adjusting. And of course, we see that in the churn in the marketplace. Stephen Hewett: Lots of the organizations I deal with they will be doing this intuitively, but they won’t be defining it. They won’t be writing it down, or won’t be measuring it. Lots of businesses out there are successful and they will typically intuitively apply this thinking, but because they don’t measure it. Because they don’t define it, then they’re not able to improve on it. And you touched on this earlier in the, “What do you do with needs?” Well what you do with needs is you make sure you deliver them, and of course you make sure you deliver them at the lowest possible cost. They have to be really well met, but at the lowest possible cost. And that’s the fundamental basis for successful business. There is more to do, but if you’re not doing that then you’re not moving down the path to being a really great successful business. Mark S A Smith: How do you measure the needs with your customers? When you’re doing this for a client, what’s the process that you go through? Is it just as simple as sampling, polling, asking people questions? 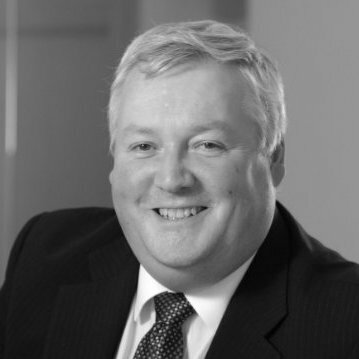 Stephen Hewett: We essentially listen to what customers are telling the organization. There’s two steps. There’s the confirmation and definition of what that small group of needs are, and we typically achieve that step by looking at the [inaudible 00:07:55] that customers are already giving the business. Many, many businesses collect data whether it’s foreign NPS or whether it’s customer feedback. What tends to happen is the organization, and if they’re big enough the organization’s insight department, will focus on the number and will rarely look at the verbatim feedback. They do that because the perception is the numbers are easier to understand, it’d be easier to focus on. Mark S A Smith: So let’s just make sure the listener knows that’s the net promoter score. A very popular way of measuring customer satisfaction, but I believe there’s some serious issues with the net promoter score. I’d like to hear your take on it. Mine initially is the problem is that it’s very difficult to satisfy people to the level where they’re going to be out there as raving fans. You’ll get a percentage who will love you no matter what you do. Percentage who hate you no matter what you do, doing the exact same thing. So the problem is that a net promoter score also halfway measures the people that hate you as well. The other aspect of it is that we’re turning over our marketing to customers and that is always a bad thing because you lose complete control. Now I want to hear your augmentation of that too. Mark S A Smith: It’s possible to fool yourself. Stephen Hewett: Absolutely. So to give you some very practical examples, an organization, one of the largest insurance providers in the UK where they were focused on the net score, the score for the business. It was only when we started to talk to them about needs and they started to look at what people were saying about their needs compared to what they were scoring their needs that the realization for the board occurred, which was, “So what you’re telling me is here’s somebody who is saying they’re quite content with our service, but they’re giving me a net promoter score of six.” Which of course as you know is actually a detractor. Mark S A Smith: You have to tell people which end of the spectrum is good. Stephen Hewett: Exactly. And the other thing is because boards are presented with a number, a single number, the other issue is that they don’t realize that that score is still to a great extent subjective. And because it’s a number, but it’s subjective based on the customer’s interpretation of the question asked. Huge difference. Mark S A Smith: Indeed. You started off with the conversation talking about how every customer’s different. It’s very difficult to measure customer needs because there are so many of them and they have widely differing needs. They also have differing experiences which to compare the current experience to past experiences. And so just coming up with a single number just cannot be enough to identify how you’re taking care of the stratification of your customers. Stephen Hewett: It can’t be. And the context in which it’s used can be misleading. So I recently had a flu jab here in the UK. Mark S A Smith: For my American audience that would be a flu shot. Stephen Hewett: Yes indeed. Yes exactly. A flu shot. Mark S A Smith: We’re separated by a common language. Stephen Hewett: Indeed. It took literally about three minutes. I did it on the way to work. And within five minutes of having the flu shot, I got a text from my local doctor’s asking me whether I would recommend them to people having flu shots. That’s clearly mad. It’s utilitarian thing. It’s not something I’m going to make a recommendation about. And I think you touched on this earlier. There’s a huge amount of golden information which is lost between net promoter score one, and net promoter score eight. Basically, have to get a nine or ten to be a promoter. But there’s a huge amount of detailed information which is below that. I would argue it’s vital to the way business understand all their customer’s need. Mark S A Smith: The fix to this is net customer needs score, where we actually do figure out what customers need and if we’re doing a good job meeting those needs, and therefore lay on top of that then the net promoter score to find out how that’s affecting their behaviors post measurement or post event, or post customer experience. Stephen Hewett: Yeah. So net promoter score is, just to be absolutely clear it’s the propensity of your customer to promote you, and net lead score is more directly about their experience now. Did you do a good job now? It’s as simple as that. Mark S A Smith: The net result is the net needs score, is going to be an indicator of do they come back, do they continue to do business with you, or are they going to churn? Do we even have the platform of creating people that are going to promote us? Stephen Hewett: Correct. It would be difficult to imagine a customer who would give you a low customer needs score, somebody who was saying, “You’re not meeting my needs,” and then go on to give you a positive net promoter score. From a common sense point of view, very simple basic principles as we talked about in the beginning, it becomes very clear about how the relationship between these two numbers work, and how customer needs score is very much about operation performance today rather than propensity to recommend tomorrow. Mark S A Smith: Interesting. In some of the conversations that we’ve had on the show, without a doubt you’ve got to get that base first. You’ve got to figure out what it is that people are going to promote absolutely lined up before you can expect for them to promote anything. Stephen Hewett: Yeah definitely. That in itself is quite important but it’s not enough. You do need to add once or the things that make a difference to the customer on top of it. But you can’t act like this if you’re delivering those basic needs. It’s as simple as that. One thing that was surprising for me was I invented this approach to thinking, this metric, with the simple objective of helping organizations do a better job on delivering to their customers. And what I’ve discovered working with clients here in the UK is that there are much farther reaching consequences of this approach. For instance, if you want to work out what your strategic direction should be where you’re likely to make best margin going forward, then all of that is almost certainly going to be a combination of delivering needs at the lowest possible cost, and developing the ability to meet once at the best possible margin. So the simple fact again, first principles, is customers want to pay the minimum amount of money for you to meet their needs, but they’re happy to pay more money, potentially with a greater margin for you to deliver their wants. Very simple principle, but the approach allows people to define that and be clearer about it, and have a structure of it. So this simple approach is also, for a number of our clients, now turned into a strategic planning. Mark S A Smith: It’s such a great way of figuring out what’s the next step in creating your successful business. This dials straight into a concept that I’ve been chewing on for a while which is the profit equation. Scarce times desirable times necessary. And we have to have all three of those things to create profit. If something is not scarce, if it’s widely available, if it’s a commodity it’s difficult to make a profit. If people don’t desire it, it’s very difficult to make a profit even if they find it necessary. 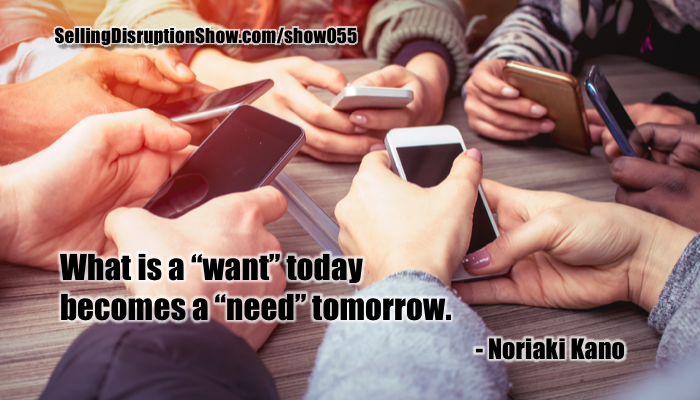 What I see here is that you’re really plugging into that whole mix of scarce, desirable, and necessary where we supply what’s necessary, that’s the net customer need score, then we also add on top of that what’s desirable. And then supply things that tend to be a little more scarce. Of course scarcity doesn’t have to be a commodity element, it can also be how the customer service is delivered, or the location that you’re serving it from. Not everybody can occupy the same piece of real estate. Or it could be that you have a secret formula a la many restaurants, Coca-Cola for example. So that scarcity creates value as well. So I really like how all those things fit together from a strategic standpoint in deciding where to go, measuring how you’re doing, and what you need to pay attention to remain profitable and competitive. Stephen Hewett: Yeah. Your interpretation is exactly right and it allows organizations to have a clear lens about how those things interact. So this very act of defining needs … And it doesn’t matter whether you’re calling something else. But they’re the same things. They’re the fundamental things that we need. As you say, they’re typically commoditized, they’re typically the things that drive sale, turnover for you. So they might be very necessary depending on your business. But time and again you could call them various different things, but they’re the things that essentially make a difference to the customer. Knowing what those things are allows you to understand the profit margin around those and where you can drive up profit and of course, as I’ve said earlier, delivering needs as the lowest possible cost also contributes to that sort of thinking. There’s just one other piece of insight I’d like to add, which is not mine. It’s borrowed from Professor Kano who did some work in the 1990’s I believe. Mark S A Smith: Well just spell his name for me please. So things move, if you like, down from wants into needs. And I have a number of clients who have come up with some fantastic innovation in the retail space. Same day delivery. Really exciting for customers. Great convenience. Really novel here in the UK. But within a very short period of time, about a year, for the customers using that service they now see that as the organization meeting a need for same day delivery. Mark S A Smith: Right on. What a brilliant example Stephen. We can sit back and we can pontificate, “Oh nobody needs same day delivery.” Oh yes they do. Stephen Hewett: Yeah. And once you have it, and it’s done really well as in the case of this large national retailer in the UK, for those customers and there are a large number, that’s now a need. That’s them meeting a need. If you don’t deliver it, then they will complain. Mark S A Smith: Absolutely true. Another example that I can think of is mobile phones. I can remember sitting in a car with one of my colleagues in the UK for the first time talking on a mobile phone. Because UK tended to be ahead of the United States in that particular technology. And thinking about, “Man I want that.” Well now it’s not a want. I don’t even have a landline anymore. Mark S A Smith: Right. So then listener you have to understand, that wants do become needs and you’ve got to stay on top of that trend if you’re going to stay ahead of the curve. That gets back to this idea that the net customer needs score that you’ve created Steven is something that has to be done a continuous ongoing basis. It’s not just one and done. Stephen Hewett: No that’s right. And that group of needs may shift or change over a period time. Our experience so far shows that it doesn’t typically change very quickly. But it will change. And organizations need to be always aware of what those needs are. And of course the needs in any sector will be driven by environmental factors. What is your competitor doing? What is the new latest thing? Say the national retailer in the UK created same day delivery ahead of Amazon. Have set the pace for other retailers in the UK. And they of course are now measured against these by their customers who shop in various different retailers. Mark S A Smith: What a great insight. One of the things you said earlier is that it’s not just a matter of doing surveys, you have to consider what the customers are saying. You said specifically you need to look at what customers say. Tell me more about that and the implications of that. Well it’s not difficult to reverse that. You can find patterns for that, and as I’ve mentioned, in most organizations our experience shows that there are no more than a handful of needs groups which typically will cover somewhere between 70% and 90% of all the customer feedback provided. Once you understand that approach, and you apply the appropriate analysis techniques, then it’s possible to get that clarity. It’s really simple. We had a chief executive of a national retail organization here just a few months ago say … We gave him a presentation at the end of his piece of analysis, and he said the best thing he could ever say to me which was, “For the first time I have absolute clarity about what we need to do next for our customers.” And that for me is a big, big payoff because that’s exactly what we’re trying to do. Mark S A Smith: I’m always so impressed by how we take something that seems so obvious that people just aren’t paying attention to and you turn into something that we can wrap our heads around and take action from. I really love the elegance that you are bringing to this. Stephen Hewett: Well thank you. Yes. So though I still claim it’s all about simplicity and very straightforward principles being applied. We have produced some machine learning software which assists with that process. So what we are now to do is put in really large quantities of data into essentially a black box which allows us to identify that simple set of needs from existing data. Mark S A Smith: Excellent. So you’re using automation now to help you stay on top of this. Is this something that we need to look at on a continuous basis? So for example, earlier you said the needs tend to change slowly, yet we still have to track them to stay ahead of our competition and keep our customers from churning. We don’t like to lose the leading edge of our customers. Is this something that’s worth looking at on a continuous basis, creating an executive dashboard to illustrate whether we’re keeping on target or if something’s drifting out of alignment that’s causing or potentially could cause a problem? Stephen Hewett: Yes I think you do. And of course we’re actually looking at two things aren’t we? We’re looking at the needs themselves. So what are the settled needs from my organization or organizations in my sector? Then of course most importantly we’re looking at how well you’re performing against those needs. While the needs groups change relatively slowly, obviously how well you are meeting them can change by a day by day, week by week, or month by month basis. So increasingly we’re finding that the CX suite of people that we deal with want a dashboard which allows them to take a snapshot based on the data which says, “Last week, these are the needs that we met really well, and these are the needs that we are falling behind on. And then that also allows you to take tangible and tactical actions to actually improve. If you’re not deliver those needs as well as you should be, and don’t forget it’s essentially a binary answer. If you’re falling behind then your competitors may be accelerating away. But as we referred to earlier, it’s also that understanding needs so you build the wants on top. If you don’t understand needs, you can’t build the wants. It’s like building a house foundation. Mark S A Smith: Stephen this has been such a great conversation. Really the … Really terrific and powerful insights you’ve shared with our listener. What do you want them to do? Do you want them to read a particular book? How do you want them to reach out to you? What’s the best way to continue on with this conversation or to tap into your wisdom and capability in your consulting? Stephen Hewett: Sure. I’d be delighted. I’m very passionate about this as you can tell. So I’d be very delighted to spread the thinking and the message, and if it helps anybody then I take personal pride in that. So you can either email me at my email address which is Stephen with a P H, Hewett. Hewett’s spelled H-E-W-E-T-T. @iCustomer.co.UK. As you mentioned I have three books, the best one to start with is the first book which is the Customer Centric You, which talks about the philosophy and the thinking behind this approach. I’m based in the UK but as you mentioned I’m a global thought leader for internal consulting group which is a global organizational. And if you pop those into a web browser then you will find that there’ll be a local office near you I’m sure. Mark S A Smith: Indeed. And you can access Stephen that way as well. Thank you for your generosity. I appreciate your insights and sharing your fantastic wisdom how to create customer relationships that continue into the future and create competitive advantage that disrupts the market place. Thanks so much Stephen. Stephen Hewett: It’s been a real pleasure Mark. Thank you.